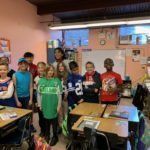 – School Spirit Week was enjoyed by all. We had a great week and the students did an amazing job sharing their enthusiasm during our closing assembly. – Mid Trimester Reports will be sent home in your child’s folder this Wednesday or Thursday. Please review it with your child and sign and return. HW- Notice the time of sunset. Record your results – What have you noticed when comparing it to last month? 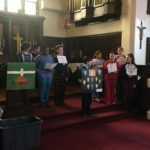 Thursday- Posters- What does Jesus expect from you? How can you show you’re a follower of Jesus? What is something you admire about Jesus? (What does admire mean? use it in your response) Draw a picture that shows you as a follower of Jesus. Extra info: What’s another name for Jesus? – Begin Presidents PBL – Why they became President of the United States of America. – I) Choosing 2 presidents from any era and researching their lives, why the ran for president, their political party, how long? 1 term or 2, Their accomplishments while president, their campaign slogans, speeches, news articles. Where are they now or had did they die? What do people say about them? II) How are the 2 alike, how are different? Which candidate would you vote for if they were your choices and why? III) Reflection, Did you enjoy this assignment? What have you learned that you didn’t know already? What else would you like to find out? HW- What is a Hurricane? Where and when do hurricanes form? Why are hurricanes dangerous? Thursday- Go over HW, view videos on Hurricanes, What fuels a hurricane? Why do hurricanes die down once they hit land? HW- Why do meteorologists categorize hurricanes using 1 through 5. What do the numbers mean?